Its not all that often that I get to send out a collection of my work to places like MN. But this last month I got the opportunity to do so! Here is a cool collection of images I captured during travels and at home, from Vero Beach to Panama and Barbados. These images are both captured in Vero Beach, Florida. Now sublimated onto Aluminum with a float mount they are ready to hang on a wall. The Aluminum Prints have a tendency to make the water look real, so gazing at these really puts you back in that moment. The Top image is "Light Filter" and is a Limited Edition Print #2/25. The Second image is "Touch Down" and is a Limited Edition Print #1/25 (#2 is currently hanging out as a 20x30 canvas in Vero Beach Yoga Barre. I'm particularly excited my client picked out this image. Shot in Panama and simply named "Panama Sunset". This was taken my first evening being there and its something I will never forget watching. "Panama Sunset" is a Limited Edition Print #1/10. The other 9 may go quick so don't hesitate putting this on your wall. Another look at the first two. "Rock of Confidence" as a negative before being heat pressed onto the Aluminum. This image was taken in Barbados last fall. My client is a stock trader, financial planner up in MN and he really liked the idea of putting this image into his office as a reminder of confidence and symbol of security, hence the name "Rock of Confidence"
It is now printed out as 40x60 on Aluminum and is a Limited Edition #1/10. ... and here they are. If your living in as cold of a state as MN I'm sure it will be nice to look at your wall and feel the tropics in these images. Sorry for the glare, the Aluminum prints are very glossy and reflective. I love that about them, makes the colors and details POP. Its a lot of fun getting my work out to people for them to enjoy. If you've seen anything here that interests you please email me at natehphoto@gmail.com and I'll get back to you ASAP. This post is from a couple sunday's ago. It was small and super inconsistent, but when the right waves came through it was so fun! The boys got a few barrels and some good times out of it, that's what matters. Brock Taylor came out to Spanish house and got shacked! Fun sequence from one of Brock's better waves. of course Chauncey Robinson made it out. He too picked out some fun waves. The storm made the lighting on this shot mental! I love this mood setting. Chauncey on a 16 frame drainer. That doesn't happen in FL often. View from the beach. It was as fun as it looks. Stoked to be able to share my photos, and even more stoked that you visited my site. As my coffee brewed and the first glimpse of light began to show yesterday morning I knew I was in for a special treat. Fog filled the perfectly still air, my first clue as to the conditions of the sea. Its mornings like these that keep my excitement going, something a little different, and totally perfect. Have a look at the pristine surf Vero Beach enjoyed at the break of dawn yesterday. Its awesome to have a slight change of background from time to time, I'll take the fog any day. This is probably my favorite image from the shoot. The surf was so calm that the reflections of the barrels were the only way to determine where the wave was actually breaking. My photos make a clearer, more distinctive look than how it was in the moment. Its good that the camera captures more than the eye. The sun even decided to make an appearance for a brief moment, making for some really amazing lighting. A perfect moment. As this barrel touches down and the pelican fly's toward shore, the lighting and ocean all came together to make one brilliant image. 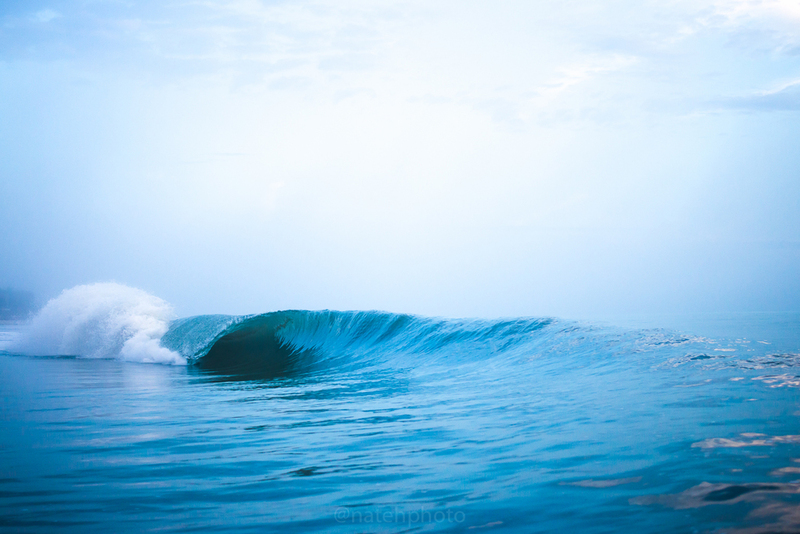 And last but not least here's a few seconds of some Slow Motion barrels from the same morning. Once the sun came out I had to play with my iPhone 6 in its WaterShot Housing. Well thank you all for visiting and enjoy your Holidays! I'm amped to showcase some images from a local shop/gallery her in Vero Beach that prints using sublimation on Aluminum! This shop is An Image Evolution and they are located on HWY 1 just north of downtown Vero Beach. I recently had my image "Imagination" put onto aluminum, during that time I took a few shots of co-owner, Jake Burns, who is the craftsman behind the prints. I'm most pleased to see the care and attention that Jake gives the work. Its always great to find a good printer, and these guys are among the best which is why I wanted to share this post. Check out the post, get inspired, and go get a print! Jake on the finishing touches for the floating frame backing which will be placed on the print. "Imagination" as a negative. Once placed on the print this will be reversed and in brilliant color. I've worked closely with every printer I have ever used, and Jake is at the top of my list for people I trust to complete a perfect job. He has a real sense of care and dedication when it comes to the final product. Here he is removing dust particles of of the Aluminum reducing the possibilities of spots in your print. The finished print on Aluminum. I choose metal because of the color and the durability. As seen here this print is fully submerged underwater, and this print now hangs in La Tabla Cafe where no one would ever know its been in a pool. The sublimation process makes way more sense than laying ink on material. Its more vibrant, perfect smooth texture in the print as if it was real life, and very weather/scratch resistant. As good as new. Water photography on water photography, I love it! You can find this piece on the wall of La Tabla Cafe on Royal Palm Point in Vero Beach, no guarantees on how long it will be in there so go get yourself a delicious lunch and enjoy the art! You can also find this for sale right here on my website in my Shop Tab. Thank You for visiting and I hope you continue to enjoy all the fun Vero Beach has to offer! I picked 20 of my favorite images from last Thursday to share in this post. Its rare when the conditions become this unique and this perfect. I'm not even sure if it could get better than this for small wave photography.. Only time will tell. These waves are any where from eight inches to two foot in face height. So very small, and very clean! I think there are a couple brilliant shots in here, pleased to share them with you! I've been working on this shot for a while now! Its been tough to get the right light and focus on a clean enough wave to show what it really looks like, this image turned out to be a very clean example of a mini tube breaking from the front. Love It! The colors looking down the line will keep me going back for more forever. A little light through the back of the wave. Super shallow focus on this mini tube. I just had this printed on Canvas as an 18x24 and that piece will be posted for sale mid next week. I've named this "hallowed glass". Can't wait to see it enlarged in my hands! There's so much more texture in the lip of the wave when they are small like this. Which is the reason I look for these conditions! It may not be as impressive as a 20ft faced barrel, but it has characteristics that can't be compared to anything else. Another great example of the unexpected happening. A little back wash fanned this barrel up. Fishermen in the background. I always wonder what they think I'm doing sticking my head into these tiny waves. Another cool shot of the lip of the wave coming at me. I'm really digging this perspective. There's nothing like a good sunrise to start your day, so get out there and enjoy one or two a week. You'll see things worth looking at! I have another post coming soon of tiny surf. The day after I took these was another score. I shot at the Vero Beach Pier and got a few gems over there. I'll try to post soon. Until then, have a solid day! ...Remeber that any of these images can be printed on several options of media including Canvas, Metallic Paper, Aluminum, Matte Paper, and Gloss Paper. They can be framed and hung. It would be my pleasure to work with you if you are looking to get some local Ocean art into your home or office. Mahalo. The ladies of my life, Double Exposure.